In the spring we had an idea to do a simple cloud backup service for Linux servers. Since then work on the project was carried out mainly in the evenings and on weekends, to expedite the process, it was decided to use only those technologies in which we have experience. For the backend-side was chosen Django, and the implementation of the client is often assumed as a SPA based AngularJS. The idea: to make the product with minimal functionality, and then gradually add new features. It was necessary to make flexible enough and scalable system. And the first question that arose was associated with routing in the client side. We needed a reliable and simple system that would support enclosed each other templates and unambiguously correlate a particular URL pattern desired. After a brief search, we chose ui-router. By the way / user is shown Landing, which has no connection with the application. When switching to / app / file server gives app.html, which contains the entire head, all the scripts at the end of a single body and a div with a modest attribute ui-view. It is in this div is loaded all the application. Depending on user is logged in or not, it shows a different filling this div’a. It is time to think about access rights of users to specific pages. If the user is not logged in, then it can only show the public pages, and when you try to approach the private page of his waiting Forced redirection to the login screen. So it is in the opposite direction: if the user has already entered, it will not be able to see the login page, registration and password recovery. Is Logged In method returns true, if the user is logged in, or false otherwise. The method determines authorize for the current state, has a right to the user to be in it. 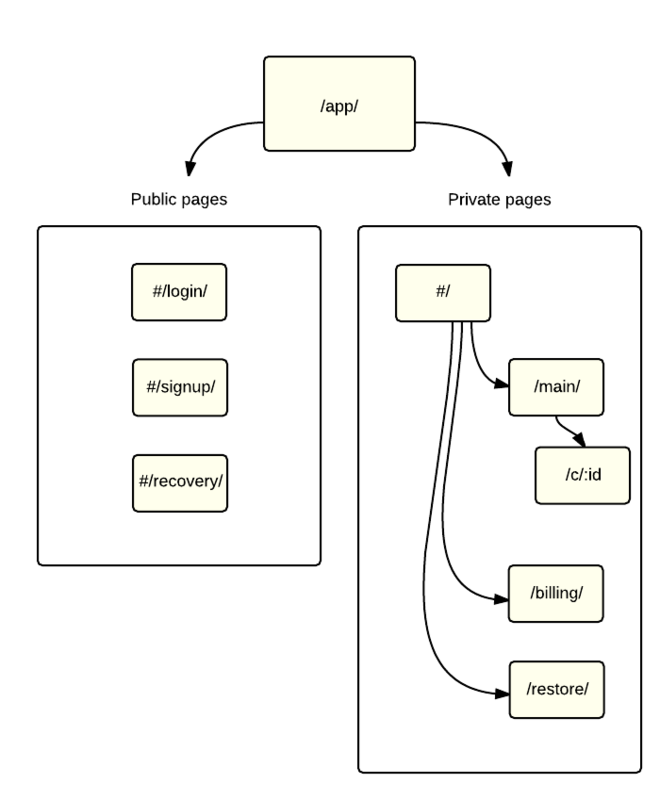 On a server with standard django-sessions is stored user information (its id). It uses standard methods django.contrib.auth. During each http-request, the server checks whether the user is logged in, and sets in the header 'Set-Cookie' appropriate value. This value is checked in the client side using $ cookieStore.get (‘login'). In order to accelerate the development and increase the flexibility of the application, it was decided to use a middleware between Django and AngularJS. The choice fell on django-angular. provides functionality to call methods in django straight from angular-controller. For more information about installing and configuring can be found in the documentation.